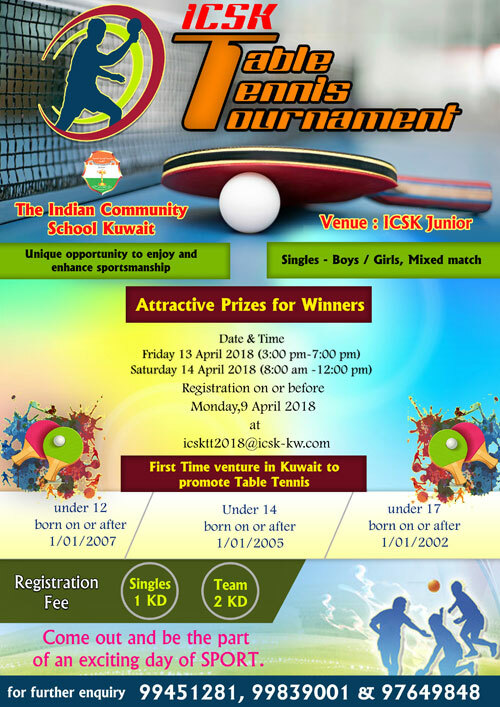 It is with great joy The Indian Community School, Kuwait announces its first ever Table Tennis Tournament for students for all Schools in Kuwait. Sports lovers can avail this unique opportunity to enjoy and enhance sportsmanship to win attractive prizes. Tournament will be conducted at the Indian Community School, Junior on Friday, 13th April, 2018 from 3 p.m. to 7 p.m. and On Saturday, 14th April, 2018 from 8 a.m. to 12 noon. Matches will be conducted under different categories for boys and girls with singles / doubles / mixed doubles for Under 12, 14 & 17 age groups.